I've been having an interesting time lately now that The Kid can walk. I walked out of the room today and came back to all of the tissues pulled out of the box. From a shelf I'm not sure how he reached. It was in less than a minute, guys. Is he a ninja? Also, he just pooped in the tub for the first time recently and I'm still amazed at the gross things I have to clean up that if it was not my kid I'd be telling their parents to get lost. And then try not to throw up. 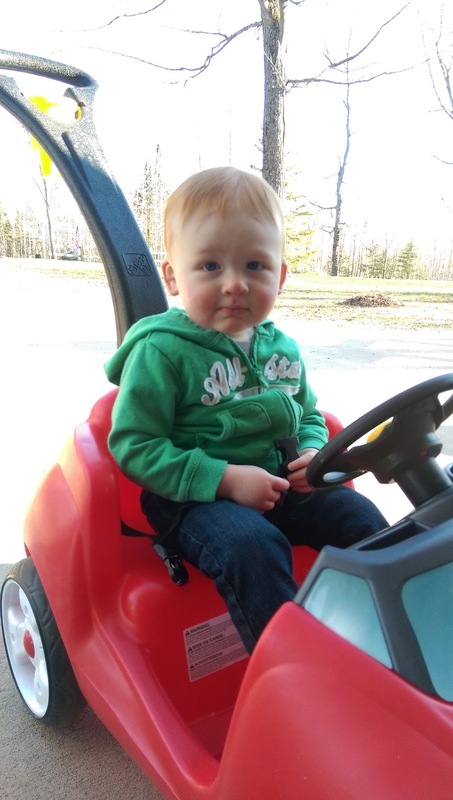 I bought him a new push car lately and he likes it a lot but he looks so smug every time you push him around in it. Like he knows he's in control and you are his slave. I mean, it's basically true so I can't blame him there. And for some reason I deep cleaned my bathroom this weekend... because I wanted to and not because people were coming. I even cleaned the outer bowl. Am I... am I an adult now? Or is this spring cleaning and this is just my body's way of saying it's going to be spring for real now? I'm hoping for spring, but being an adult wouldn't be the worst thing... as long as it doesn't interfere too much with fun stuff. Because what is life without fun?